The tarsal tunnel refers to the canal-like structure formed between the medial malleolus, or the inner part of the ankle, and the flexor retinaculum, or ligaments that cross the foot. 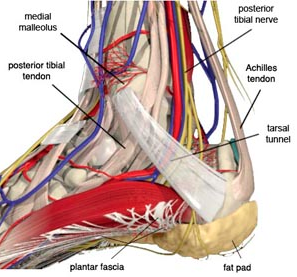 The tarsal tunnel contains parts important to normal function of the foot, such as the tibial blood vessels and nerves, as well as the tendons of the tibialis posterior, flexor digitorum longus, and flexor hallucis longus muscles. These structures form a bundle as they pass through the tunnel formed by the medial malleolus and flexor retinaculum. 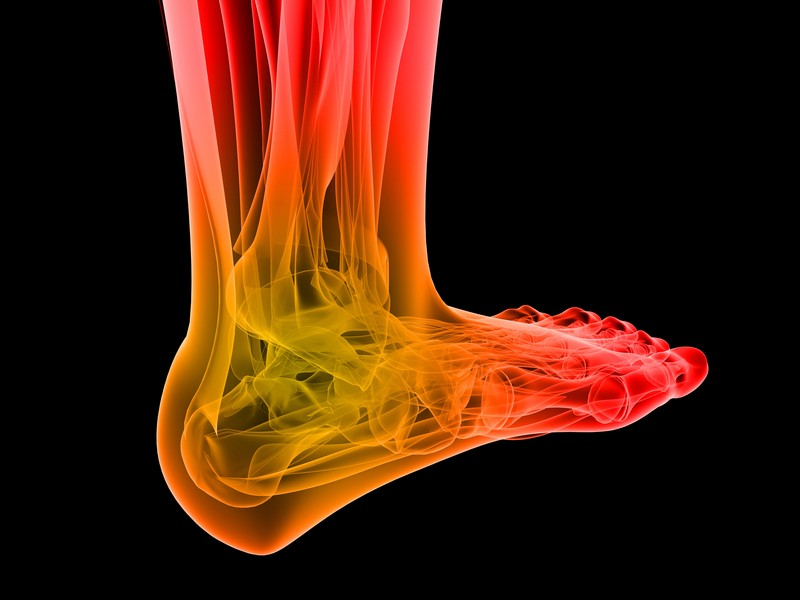 Tarsal tunnel syndrome (TTS) is also referred to as posterior tibial neuralgia. This condition results from the compression of the tibial nerve, causing pain that radiates from the ankle. This can also be accompanied by a tingling, tickling, or burning sensation known as paresthesia. While pain is the most typical presentation of TTS, it can also present with decreased sensation over the foot, muscle weakness, or gait abnormality. The compression of the tibial nerve is usually secondary to local physical causes, such as space-occupying lesions, bony prominences, or growths near the tarsal tunnel. Injuries and external physical trauma can also cause TTS. The goals of treatments for TTS are the relief of compression of the tibial nerve, relief of pain and other symptoms, and return to normal function. The treatment of TTS normally begins with more conservative, nonsurgical interventions. It is recommended to consider surgery only when TTS is intractable to these treatments. The exact treatment for each case will depend on individual circumstances, and discussion with a licensed orthopedic specialist is necessary to make the best decision. Pain management can be done through oral pain medications, such as non-steroidal anti-inflammatory drugs (NSAIDs), which also reduce the swelling and inflammation of the nerve. The injection of corticosteroids and local anesthesia has been shown to be effective in treating TTS. The management of the pain and inflammation is also coupled with rehabilitation and physical therapy programs to strengthen and condition the surrounding muscles. Other complementary and alternative treatments have been explored, such as acupuncture, physiotherapy, and wrapping, although more evidence to their effectiveness is needed. The surgical treatment for TTS can usually provide definitive resolution to the underlying causes, although the procedure is not without risk. The major goal of surgery is to relieve the tibial nerve from the causes of compression, thereby addressing the irritation that causes the symptoms. The tarsal tunnel is “released” to increase the space for the tibial nerve. Other causes of compression, such as cysts, masses, or bone fragments, are also removed during surgery. While most patients normally report good outcomes after the surgery, postoperative complications such as stiffness, bleeding, and persistent pain have been reported. The rates for complications go as high as 13 percent in some reports. Surgery will also require postoperative immobilization of the joint and the use of crutches for up to several weeks. There is also the risk of postoperative infection, and intraoperative damage to the surrounding muscles and tissues.